Behold! Tux, the virtuous and noble bird of the Linux operating system. He is at once masquot and logo, set free into this world to bring smiles and chuckles to coders and kernel hackers. Tux is the fourth installation of my Painting A Day Blog. This painting is special because it was painted 2 or three years ago, and it's a large, 11x14 oil painting. The painting has a commanding presence, the image boldly stands out. I purposely painted it loosely, with obvious brush strokes to give this Tux portrait a "painterly" look. I believe Tux's smile is as enigmatic as the Mona Lisa's, don't you think? I constantly wonder what is behind that smile, it's like he knows something that I don't, perhaps he's sitting quietly knowing the meaning of life and not telling anyone, and for this, he smiles. Or maybe he feels good about representing an open source operating system and he is not bound by worldly laws, he is truly free. Snaggy and I made a Joy of Tech comic about Tux and a painting, it was an early JoT. 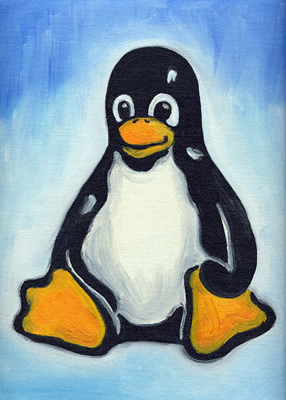 I'm thinking there is a Linux Geek who would love this original oil painting by Nitrozac, perhaps there is a Linux geek on your Christmas list? Stuffed Tux dolls are a dime a dozen, but I have never heard of any oil paintings of Tux being up for grabs! Methinks this is an opportunity that should not be missed! Happy Bidding!